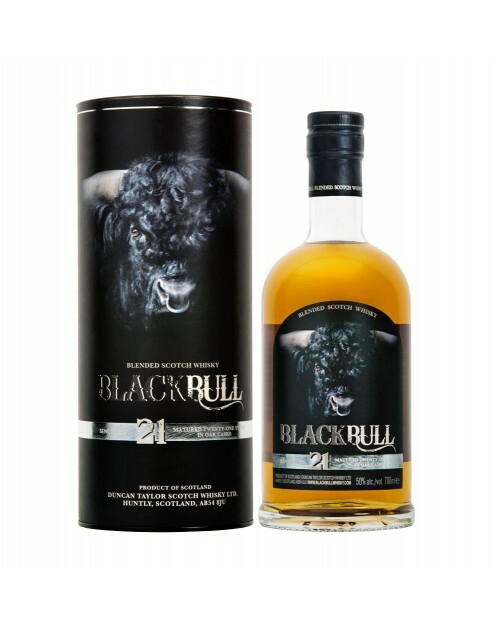 The Black Bull 21 Year Old blended Scotch whisky from Duncan Taylor once again shows off the blending prowess behind the brand. This expression features a high proportion of Highland whiskies, as well as some Speyside and a touch of Islay, with a 55% malt to grain ratio. Big, bold and spicy, this bull definitely has horns. Nose: Opens with huge notes of juicy, fresh apples and oranges, followed by sweet, slightly burnt brown sugar notes. Palate: Spicy on the palate with nutmeg and clove, balanced with rich vanilla, malt and more Demerara sugar. Finish: A balanced finish of spice and sweetness. Overall: Extremely smooth and well balanced, understated smokey notes of goodness.